Stare deep into the eye of this planetary disk because something is forming in there—something incredible. This photo of star TW Hydrae from the ALMA Observatory is the most detailed shot of a protoplanetary disk ever captured. It’s not the star or the disk around it that has scientists really excited, though. It’s the gaps, particularly one familiar one which shows a planet forming at exactly the orbiting distance between the Earth and the Sun. 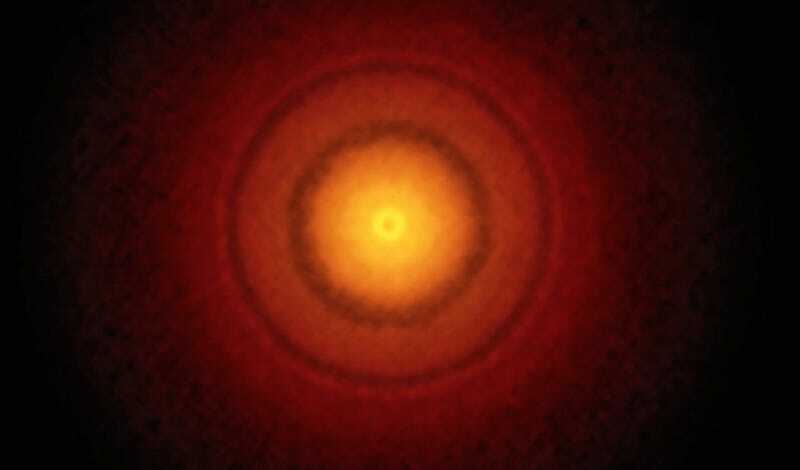 “The new ALMA images show the disk in unprecedented detail, revealing a series of concentric dusty bright rings and dark gaps, intriguing features that suggest a planet with an Earth-like orbit is forming there,” explains lead author of the paper in Astrophysical Journal Letters, Sean Andrews of the Harvard-Smithsonian Center for Astrophysics. ALMA Observatory describes the still forming structure as being consistent with either “an infant version of our home planet” or perhaps a larger “super-Earth” version. Of course, planet formation is slow, uncertain business and it’s not clear yet precisely what kind of planet will eventually emerge from the dust. Still, in a universe of countless cold, dead planets, it’s just-right position around a star makes it a potential planet with incredible possibilities for study, for research, and perhaps even, someday in the far distant future, for life. And that’s worth keeping an eye on.